The Ehlers-Danlos syndromes (EDS) are currently classified in a system of thirteen subtypes. Each EDS subtype has a set of clinical criteria that help guide diagnosis; a patient’s physical signs and symptoms will be matched up to the major and minor criteria to identify the subtype that is the most complete fit. There is substantial symptom overlap between the EDS subtypes and the other connective tissue disorders including hypermobility spectrum disorders, as well as a lot of variability, so a definitive diagnosis for all the EDS subtypes—except for hypermobile EDS (hEDS)—also calls for confirmation by testing to identify the responsible variant for the gene affected in each subtype. Molecular diagnostic strategies should rely on NGS technologies, which offer the potential for parallel sequencing of multiple genes. Targeted resequencing of a panel of genes is a time- and cost-effective approach. When no mutation (or in case of an autosomal recessive condition only one mutation) is identified, this approach should be complemented with a copy number variant (CNV) detection strategy to identify large deletions or duplications. There are nine minor criteria. Minimal clinical standards suggesting cEDS are the first major criterion plus either the second major criterion or at least three minor criteria. A final diagnosis requires confirmation by molecular testing. More than 90% of those with cEDS have a heterozygous mutation in one of the genes encoding type V collagen (COL5A1 and COL5A2). Rarely, specific mutations in the genes encoding type I collagen can be associated with the characteristics of cEDS. Classical EDS is inherited in the autosomal dominant pattern. Skin is hyperextensible if it can be stretched over a standardized cut off in the following areas: 1.5 cm for the distal part of the forearms and the dorsum of the hands; 3 cm for neck, elbow and knees; 1 cm on the volar surface of the hand (palm). Abnormal scarring can range in severity. Most with cEDS have extensive atrophic scars at a number of sites. A minority are more mildly affected. The relevance of surgical scars should be considered with caution in classical EDS, they can appear normal in patients with classical EDS if well managed. Atrophic surgical scars can be found in the general population due to mechanical factors and site of the incision. Joint hypermobility is evaluated according to the Beighton score; a Beighton score of >5 is considered positive for the presence of generalized joint hypermobility. Since joint hypermobility decreases with age, patients with a Beighton score <5/9 may be considered positive based on their historical observations. For more information, please see Ehlers-Danlos syndrome, classical type. For information on COL1A1-cEDS, please see The Ehlers-Danlos Syndromes, Rare Types. Easily bruised skin or spontaneous ecchymoses (discolorations of the skin resulting from bleeding underneath). There are seven minor criteria. Minimal clinical standards suggesting clEDS are all three major criteria plus a family history compatible with autosomal recessive transmission. A final diagnosis requires molecular testing; clEDS is caused by a complete lack of Tenascin XB (due to biallelic TNXB mutations, that lead to nonsense-mediated mRNA decay, or biallelic deletion of TNXB). TNXB is the only gene associated with clEDS. Classical-like EDS is inherited in the autosomal recessive pattern. Note: skin hyperextensibility and joint hypermobility are defined as in cEDS. For more information, please see The Ehlers-Danlos Syndromes, Rare Types. Joint hypermobility (generalized or restricted to small joints). There are four minor criteria. Minimal clinical standards suggesting cvEDS are the first major criterion plus a family history compatible with autosomal recessive transmission, and either one other major criterion or at least two minor criteria. A final diagnosis requires confirmation by molecular testing; cvEDS is caused by a complete lack of the proa2-chain of type I collagen due to biallelic COL1A2 mutations, that lead to nonsense-mediated mRNA decay. COL1A2 is the only gene associated with cvEDS. Cardiac-valvular EDS is inherited in the autosomal recessive pattern. Carotid-cavernous sinus fistula (CCSF) formation in the absence of trauma. There are twelve minor criteria. Minimal clinical standards suggesting vEDS diagnostic studies should be performed are: a family history of the disorder, arterial rupture or dissection in individuals less than 40 years of age; unexplained sigmoid colon rupture: or spontaneous pneumothorax in the presence of other features consistent with vEDS. Testing for vEDS should also be considered in the presence of a combination of the other “minor” criteria. A final diagnosis requires confirmation by molecular testing. Patients with vEDS typically have a heterozygous mutation in the COL3A1 gene, with the rare exception of specific heterozygous arginine-to-cysteine substitution mutations in COL1A1 that are also associated with vascular fragility and mimic COL3A1-vEDS. In very rare instances, biallelic pathogenic variants in COL3A1 may be identified. Vascular EDS is inherited in the autosomal dominant pattern. For more information, please see “Diagnosis, natural history, and management in vascular Ehlers-Danlos syndrome”. The diagnosis of hypermobile EDS (hEDS) remains clinical; there is no molecular, genetic cause yet identified, so there is no test available for almost all with hEDS. There is a clinical spectrum ranging from asymptomatic joint hypermobility, through “non-syndromic” hypermobility with secondary manifestations, to hEDS. A diagnosis of hEDS should be assigned only in those who meet all of the criteria, which should help research efforts to discover the underlying genetic cause(s) which, in turn, may help clinical management. As this is a clinical diagnosis, it’s important to be relatively confident that the diagnosis is not instead one of the many other disorders of connective tissue. Hypermobile EDS is inherited in the autosomal dominant pattern. The clinical diagnosis of hEDS needs the simultaneous presence of criteria 1 and 2 and 3. This is a complex set of criteria, and there is much more detail than presented in this overview; please see the page for hypermobile EDS. All these prerequisites must be met: absence of unusual skin fragility, exclusion of other heritable and acquired connective tissue disorders including autoimmune rheumatologic conditions, and exclusion of alternative diagnoses that may also include joint hypermobility by means of hypotonia and/or connective tissue laxity. There are five minor criteria. Minimal criteria for aEDS are congenital bilateral hip dislocation (major criterion 1) plus either: skin hyperextensibility (major criterion 3); or severe GJH (major criterion 2) with at least two minor criteria. A final diagnosis requires confirmation by molecular testing; aEDS is caused by heterozygous mutations in either COL1A1 or COL1A2, that cause entire or partial loss of exon 6 of the respective gene. No other genes are associated with aEDS. Absence of a causative mutation in COL1A1 or COL1A2 that leads to complete or partial deletion of the exon 6 of either gene excludes the diagnosis of aEDS. Arthrochalasia EDS is inherited in the autosomal dominant pattern. There are nine major criteria and eleven minor criteria. Minimal criteria suggestive of dEDS include the two major criteria of extreme skin fragility and characteristic craniofacial features, plus either: one other major criterion, or three minor criteria. A final diagnosis requires confirmation by molecular testing; dEDS is caused by biallelic mutations in ADAMTS2. It is the only gene associated with dEDS. Dermatosparaxis EDS is inherited in the autosomal recessive pattern. GJH with dislocations/subluxations (shoulders, hips and knees in particular). There are ten minor criteria, as well as gene-specific minor criteria (four for PLOD1 and four for FKBP14). Minimal criteria suggestive for kEDS are 1 and 2 of the major criteria—congenital muscle hypotonia and congential/early onset kyphoscoliosis—plus either: major criterion 3, or three minor criteria (either general of gene-specific). A final diagnosis requires confirmation by testing. The majority of patients with kEDS harbor biallelic mutations in PLOD1; recently, biallelic mutations have been identified in FKBP14 in patients displaying a phenotype that clinically largely overlaps with kEDS-PLOD1. Laboratory confirmation should start with a urine test using high-performance liquid chromatography (to evaluate the ratio of lysyl-pyridinoline to hydroxylysyl-pyridinoline crosslinks; a normal ratio is ~0.2, whereas kEDS-PLOD1 range is 2-9). This method is fast and cost-effective and it can also be used to determine the pathogenic status of a variant of uncertain significance. Molecular analysis can follow if the urine test is normal. Whereas absence of an abnormal urinary LP/HP ratio excludes the diagnosis of kEDS-PLOD1, absence of the confirmatory genetic findings does not exclude the diagnosis of kEDS, as other yet-to-be-discovered genes may be associated with this phenotype; however, alternative diagnoses should be considered in the absence of PLOD1 or FKBP14 mutations. Kyphoscoliotic EDS is inherited in the autosomal recessive pattern. There are fourteen minor criteria. Minimal criteria required to suggest BCS are the first major criterion, plus either: at least one other major criterion; or three minor criteria. A final diagnosis requires confirmation through molecular testing. BCS is caused by biallelic mutations in either ZNF469 or PRDM5. At least one family with a clinical BCS phenotype did not harbor mutations in these genes, suggesting that at least one other gene might be associated with BCS. Brittle cornea syndrome is inherited in the autosomal recessive pattern. There are five general minor criteria, plus gene-specific criteria for B4GALT7, B3GALT6, and SLC39A13. Minimal criteria required to suggest a diagnosis for spEDS are the first and second major criteria, plus characteristic radiographic abnormalities and at least three minor criteria (either general or gene-specific). Spondylodysplastic EDS is inherited in the autosomal recessive pattern. Characteristic cutaneous features including skin hyperextensibility, easy bruisability, skin fragility with atrophic scars, increased palmar wrinkling. There are fifteen minor criteria. The minimum criteria required to suggest mcEDS are: at birth or in early childhood, major criteria 1 and 2; in adolescence and adulthood, major criteria 1 and 3. A final diagnosis requires confirmation through molecular testing. Musculocontractural EDS is caused by biallelic mutations in CHST14. A few mutations have been identified in the DSE gene in patients with a similar phenotype. 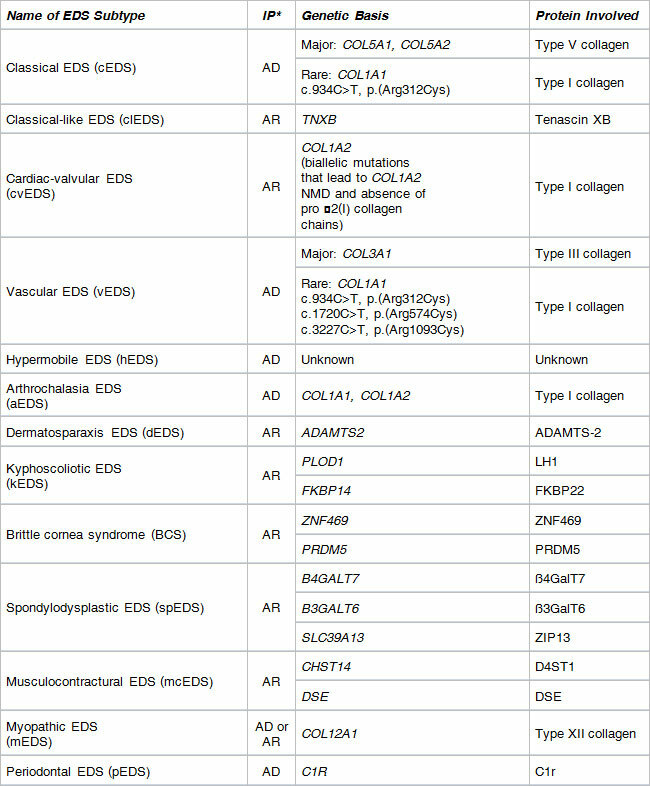 Musculocontractural EDS is inherited in the autosomal recessive pattern. There are four minor criteria. The minimal criteria required to suggest a diagnosis of mEDS are the first major criterion plus either: one other major criterion, or three minor criteria. A final diagnosis requires molecular testing; mEDS is caused by heterozygous or biallelic mutations in COL12A1, and the clinical phenotype highly overlaps with collagen type VI-related myopathies. It is currently unknown whether other, yet to be discovered genes, are associated with this phenotype. In case no COL12A1 mutations are identified alternative diagnoses, especially collagen VI-related Ullrich Congenital Muscular Dystrophy and Bethlem Myopathy, should be considered. Myopathic EDS is inherited in either the autosomal dominant or the autosomal recessive pattern. Family history of a first-degree relative who meets clinical criteria. There are eight minor criteria. The minimal criteria required to suggest pEDS are the first criterion or the second criterion, plus at least two other major criteria and one minor criterion. A final diagnosis requires molecular testing; pEDS is caused by heterozygous gain-of-function mutations in C1R or C1S. At present it cannot be stated whether absence of a C1R or C1S mutations excludes the diagnosis because the experience with the molecular diagnosis is limited. Periodontal EDS (pEDS) is inherited in the autosomal dominant pattern. There is an additional genetic classification structure of the EDS into groups according to similarities in the way the responsible genes affect the body. Group A: Disorders of collagen primary structure and collagen processing, comprised of cEDS, vEDS, aEDS, dEDS, and cvEDS. Group B: Disorders of collagen folding and collagen crosslinking, comprised of kEDS-PLOD1 and kEDSS-FKB14. Group C: Disorders of structure and function of the myomatrix, comprised of clEDS and mEDS. Group D: Disorders of glycosaminoglycan biosynthesis, comprised of spEDS-B4GALT7, spEDS-b3GALT6, mcEDS-CHST14, and mcEDS-DSE. Group E: Defects in complement pathway, comprised of pEDS. Group F: Disorders of intracellular processes, comprised of spEDS-SLC39A13 and BCS. Group G: Unresolved forms of EDS, comprised of hEDS. Conditions no longer included in the EDS spectrum are occipital horn syndrome, fibronectin-deficient (EDS X), familial articular hypermobility (EDS XI), X-linked EDS with muscle hematoma (EDS V), and filamin A related EDS with periventricular nodular heterotopia.